More tasty breakfast (mostly pork buns) and a swift check out by 8am. 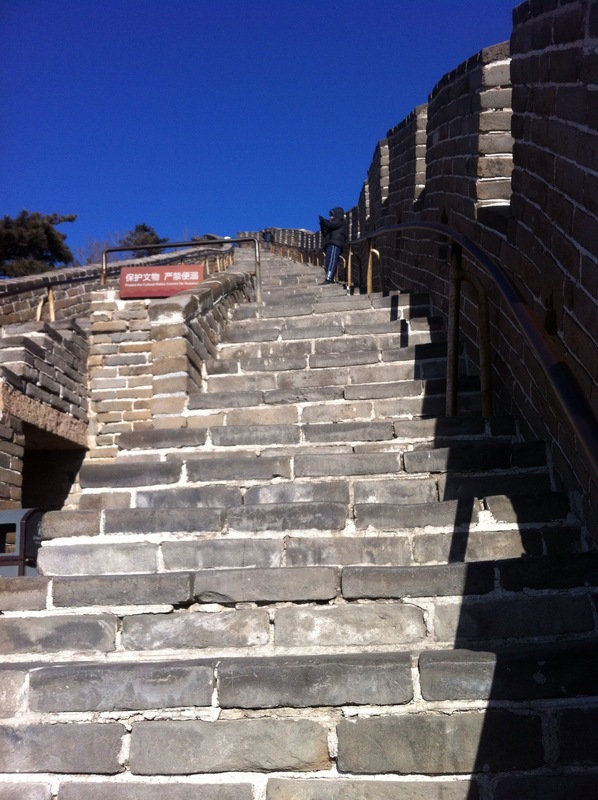 Most of the group went off to see the Xi’an city wall (apparently the biggest city wall in the world). A few of us, HB and I along with HB’s brother and his wife, went off on a special family expedition with a lady from the Xi’an cultural heritage centre. The expedition was to see an exhibition put together with help from HB’s cousin David Brough – about the work of a group of quakers who went to offer aid in China and Burma in the 1940s. It was lovely to see HB and his brother posing next to an old photograph of their great uncle Bill in the exhibition – the quaker group went on to win the Nobel Peace Prize for their efforts. A great article and more information is here. We rejoined the group at the Large Wild Goose Pagoda in town, a lovely temple which had all of the beauty and sincerity that the Famen temple didn’t. We got a very quick tour from a very keen tour guide who got very annoyed if we weren’t paying full attention. We had a small lecture on chinese calligraphy and painting, which was very interesting – and we were shown how to make ink and how to do the basic 8 strokes, as drawn in the character for eternity. After lunch we jumped on our bus, and stayed on it for a very long time. Epic bus ride through endless mountain tunnels to our next location – the legendary Wudang mountain. 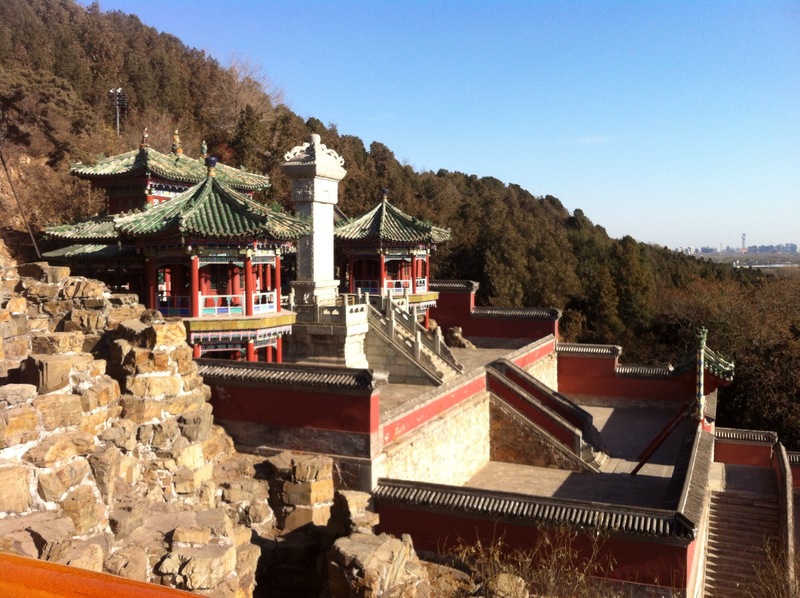 Our hotel was in town at the foot of the Wudang mountains scenic area. We arrived late and hungry to an insanely cold hotel, where all the staff, even the waitresses at dinner were wearing outside coats and hats! This entry was posted in Uncategorized and tagged china on 31 December,2014 by antalbot. Woke up to a pollution count of 200; very glad we brought breathing masks with us. On a better note we woke to an unbelievable hotel breakfast with everything from hash browns and baked beans to the now compulsory congee and fried devils, pork buns, pickles, fried rice, veg, Danish pastries, croissants, peanut chilli noodles, infinite egg varieties and banana bread! After eating as much as possible, we travelled a little out of the city to to tomb of the Tang Dynasty 3rd Emperor and Empress (Wu Ze Tian, China’s only female in the big seat). Wu Ze Tian rose from being a concubine to the 2nd Tang Emperor before seducing his son – who then returned her to the palace as his own concubine, and later wife, on his father’s death. The tour guide hinted at lots of other exciting tales, including murdering her own daughter and deposing other wives in order to take power. 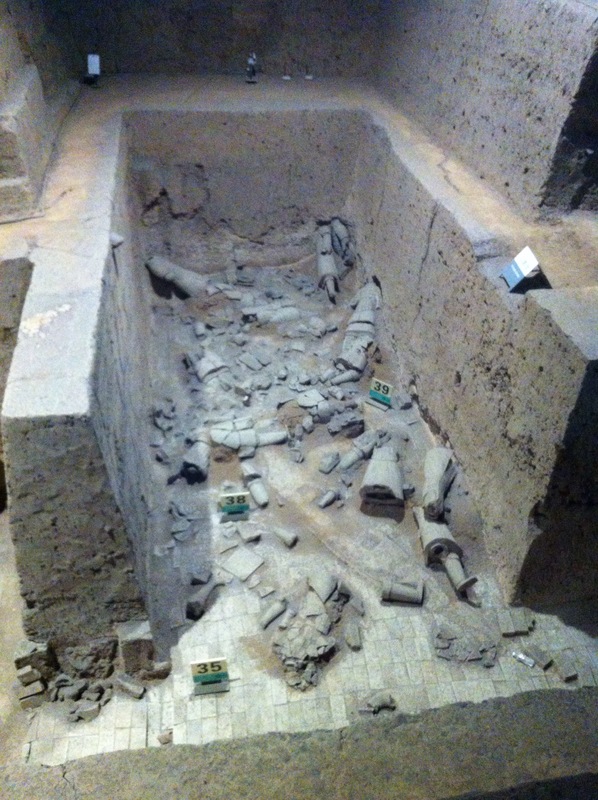 We were able to visit their mausoleum running alongside their tomb – other which was discovered in recent decades but not opened – waiting for a time when what is inside can be preserved. More evidence of a foresight and pan-generational perspective within China which I bet is unrivalled in the world. We climbed the natural hill in which the tomb was found (but sealed with molten steel to be opened on pain of death – literally). Not bad considering I was in a skirt and casual shoes. Kind comparisons to gentlewomen lady Victorian explorers as I held up my skirt while scaling the near vertical and very slippery rocks near the summit. Interesting conversation from the tour guide on the way to lunch – who answers our questions about the Chinese views on the afterlife. As with the Saxons, Egyptians (and no doubt others), people would leave precious objects – food, money, weapons, pots and pans even animals in the grave to help the departed in the next life. In current times, most monotheistic religions and all but removed these types of traditions. In China, paper effigies of objects are now burnt as funeral offerings – paper money, paper cars, paper iphones even (to the bus’s amusement) paper wifi routers. After this we went on to the Famen Temple, an enormous national complex of Buddism with everything you could possibly seek from an Avenue lined with giant Buddha statutes and meditative gardens with delicate music coming out of fake rocks on the ground. Sadly to us most of the complex felt cold and corporate with no feelings of tranquility or peace. The site is home to a sacred relic belonging to Sakyamuni – lost for centuries then found beneath an old pagoda on the site in the 1980s. We were lucky to get a sight of it in the new building recently constructed for it – and looking disturbingly like an pagoda housed within an alien death ray machine. We left unsatisfied (particularly the practicing buddhists among the group) feeling like we had just been through some sort of tourist propaganda. A better end to the night in the Xi’an Muslim quarter, with a bucketful of Bau – special dumplings with vegetable soup on the inside. 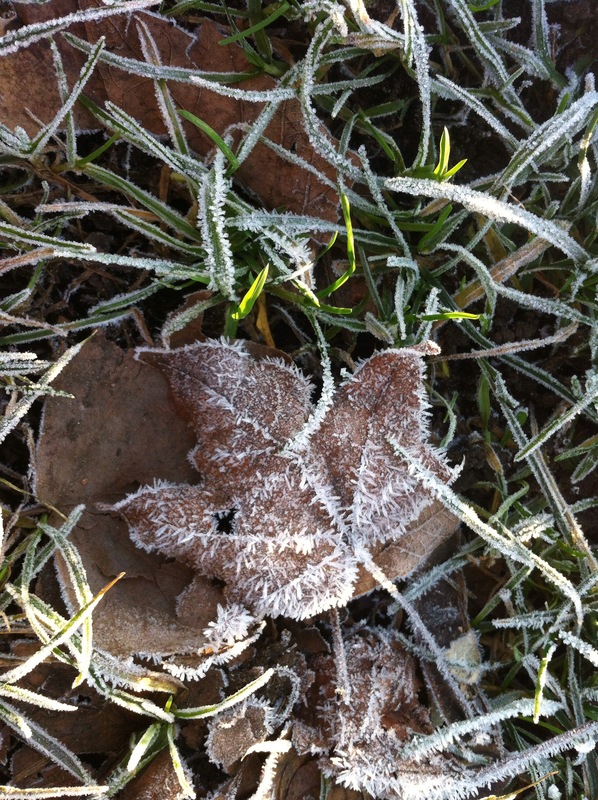 This entry was posted in 05 Photography and tagged haw frost, ice, winter on 30 December,2014 by antalbot. 4.30am wake up call. Ouch and very unhelpful while dealing with jet lag. Breakfast in a box on the bus to Beijing airport. HB joked that it would be ham sandwiches, and lo and behold it was: ham and cheese sandwich and a boiled egg – a Chinese view of what westerners eat. Quick bus journey and we were soon headed on a plane for Xi’an a couple of hours west of Beijing in Shaanxi province. The flight to Xi’an took us out over the mountains; another endless great expanse. You really start to feel the vastness of the country and understand how it affects the whole psychology of the people of China. The final descent into Xi’an was very impressive – views over paddy fields and open countryside. We were picked up by a new tour guide for the airport, who was funny and very knowledgable about the city. He was happy to discuss ancient history and switch to modern economics as we passed one of the seven power stations in the city. 9m people and Pollution count of 170; the smog was obvious and unpleasant. First stop straight from the airport was the Terracotta Army, one of the things I’ve always wanted to see. 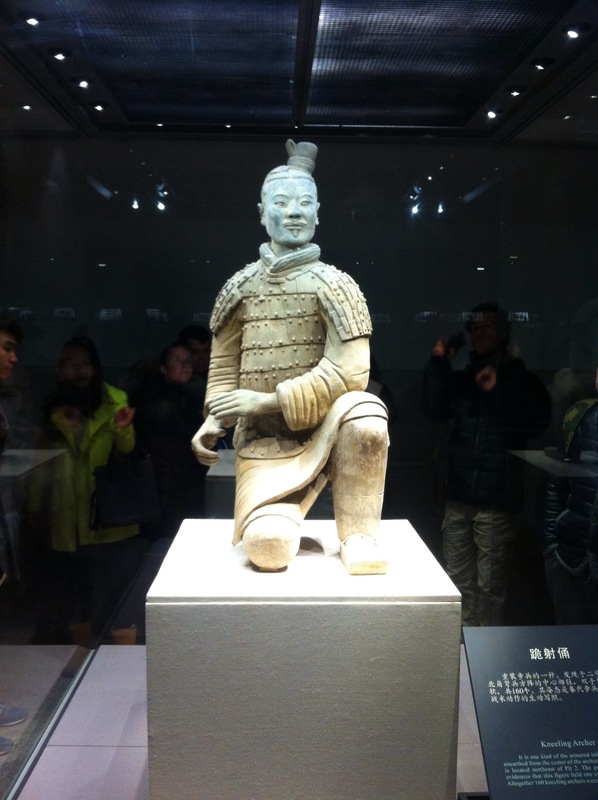 Our guide told us of the history of the very first emperor of China, Qin Shi Huang, who was the first man to unify China and end a long period of war. He was crowned (?) at 13, and already fearful of the afterlife, ordered work to begin on his tomb. The museum was amazing and very well done, showing the archeological work which has been done on preserving and restoring the parts of the huge site which have been excavated so far. 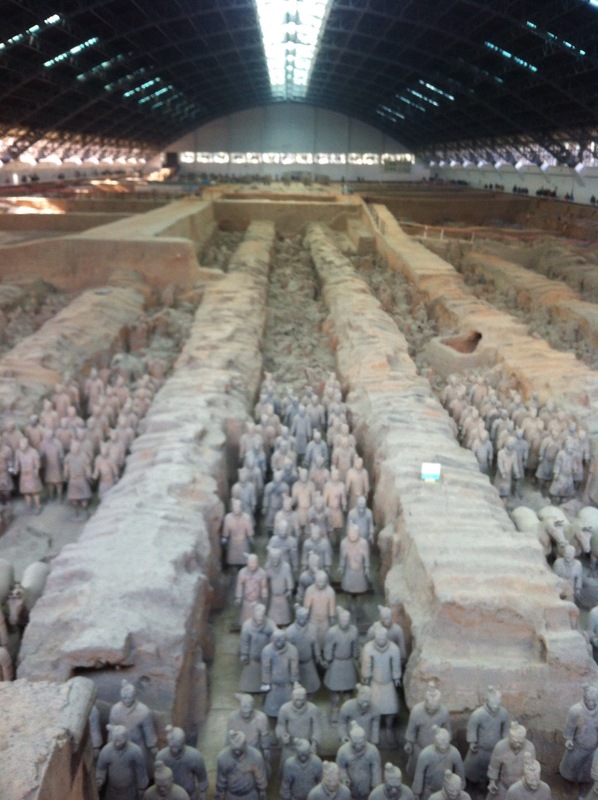 Words cannot describe it and pictures do no justice to the endless rows and rows of ceramic warriors and horses which stand guard of the body of Emperor Qin. Each of the soldiers faces are different, and very realistic, based upon the different ethnic groups present in Qin’s army at the time. I had heard that the potters of the time are likely have been influenced by Greek portraiture as this type of realism in ceramics hadn’t been seen before in Chinese art. So incredible, and somewhat creepy. This army would scare anyone, even from the afterlife. In the midst of all of this was a very tasty lunch, with more pork buns, and five varieties of hand pulled noodles. And soup. And deep fried aubergines, rice and oddly tasty warm stir-fried celery. 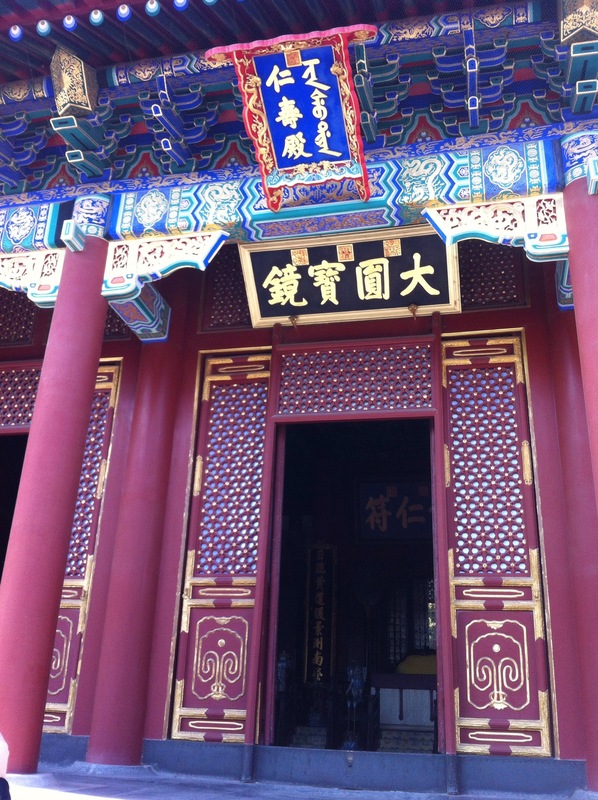 After the museum we went on to the Winter Palace, built for the Lady Yang during the Tang Dynasty. She was a concubine of one of the Tang Dynasty emperors, apparently famous for being very beautiful and a bit plump. The palace was destroyed many centuries ago, and rebuilt completely in 1980. It gave us a rather odd feeling wandering around a reconstruction, which was only casually dropped into conversation by the tour guide. The Lady Yang Wei Fei had some fascinating stories associated with her, including a meteoric rise up the ranks of the concubines from 7th level to 1st level in two years. Complicated business all these concubines and wives. After the palace we went to dinner and then out for a walk near our hotel. We accidentally happened upon an amazing night Market – feeling like a glimpse into real China at last. Amazing Street food – meat or chilli tofu skewers, twirly bread sticks, flower pepper peanuts, pomegranates, watermelons, fried noodles as well as stalls of random stuff from beads to socks to iPhones. 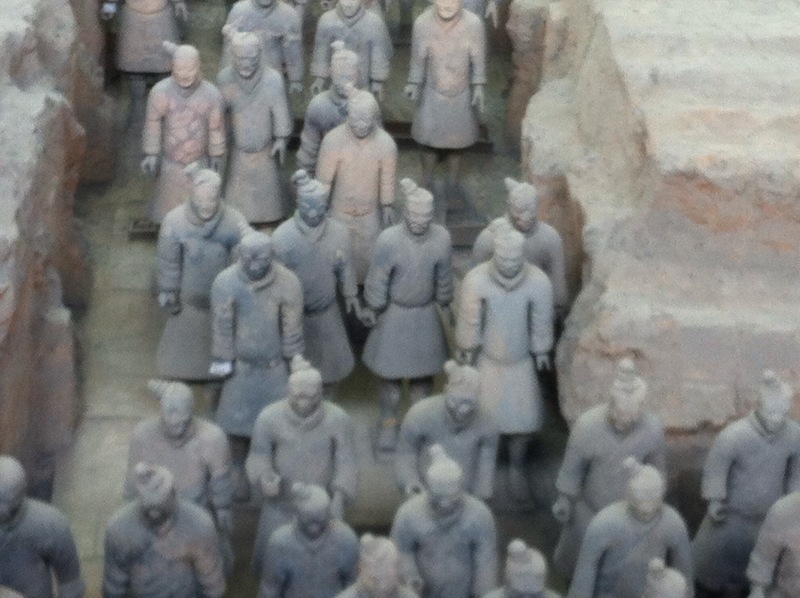 This entry was posted in Uncategorized and tagged Qin, terracota army on 21 December,2014 by antalbot. Well, what a week it has been!! 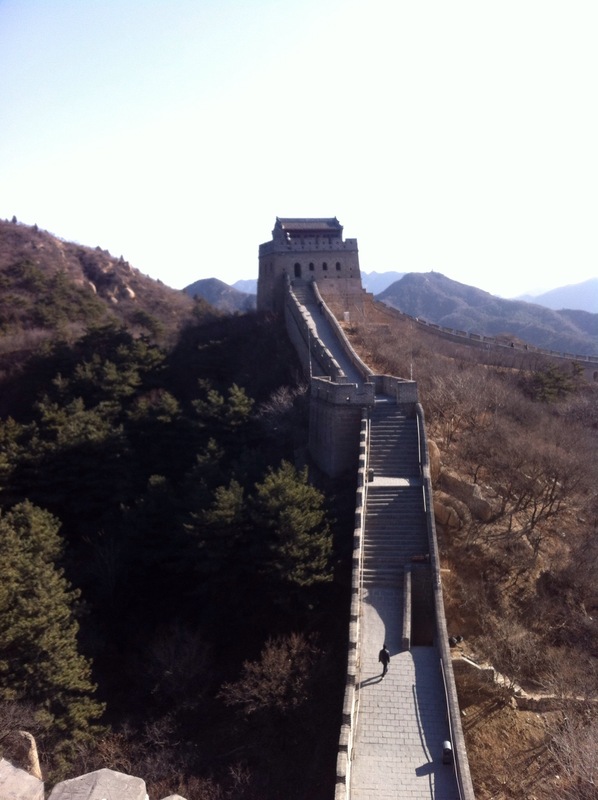 Just arrived back into the UK after an epic 36 hour journey back from central China. Now getting round to writing up the amazingness of the trip away, due to hazy wifi while travelling. We arrived in the colossal Beijing airport around 9am local time (body clock time completely confused) and welcomed by the below freezing air on arrival. Being intrepid adventurers we went straight onto our tourist bus and on to visit the Summer Palace. Built for the Dowager Empress Ci Xi (the dragon lady) we walked around the massive site, getting our first glimpses of palace, temple, frozen lake and tales of imprisoned emperors, poisonings and sacred rocks. I found it very interesting to see how well the mix of vast modern city, with a rather ridiculous volume of neon everywhere, sits so neatly among such a range of old relics and sites. The mix of ancient heritage and modern seemed to me not to feel contradictory. Is this how the locals feel? 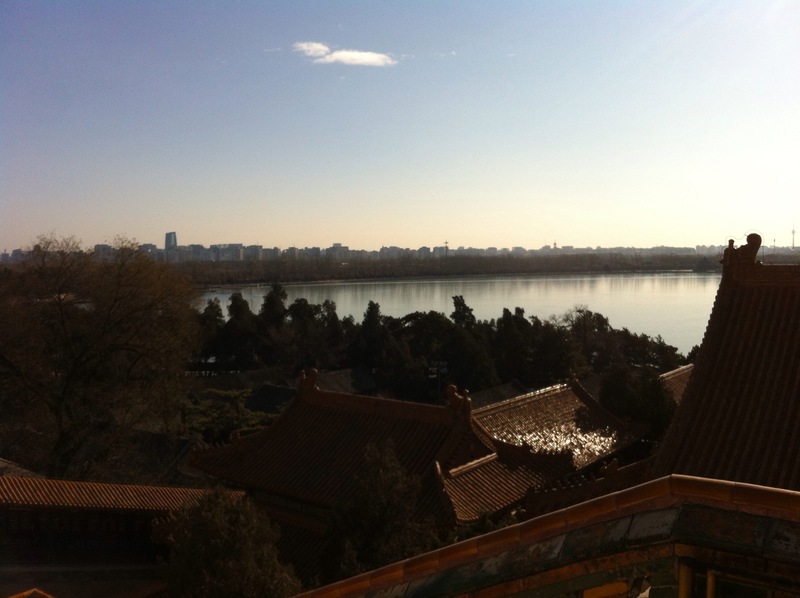 After the summer palace we went out to lunch. Out tour guide was clearly used to some very unworldly people as she amusingly started trying to explain what Chinese food was (and how to use chopsticks) to us – a group of Kung fu students plus me who all eat rather a lot of Chinese food! After lunch we made it to the hotel after a 2 hour drive from the other side of town (only just a few km away) to get a shower before heading back out. We went to visit Tiananmen Square on the way to dinner which we saw as the sun was setting. Very formal place, with a feeling of no real life – and strange to see the square so often portrayed on international TV as the heart of China’s capital city. Also quit strange to see the famous red gate with the haunting image of Chairman Mao ringing around the vast expanse of the a Forbidden City. From here we went to a tea house for food and to experience an amazing array of Chinese Cabaret acts – from Sichuan face changing, to opera singing, shadow play, traditional ladies dancing and a long spout teapot performance. Alongside an endless pot of tea and snacks. Great to see all locals in the audience too, it was nice to be the only westerners in the room. Breakfast in our hotel, which had Jingle Bells on repeat in the foyer (alongside the giant neon christmas tree, mini grotto and giant gingerbread house). Huge range of stuff from fried noodles, eggs steamed veggies, pickles, fruit, banana bread, a few nods to “western tastes” (bread, ham, cheese, Danish pastries and muffins). 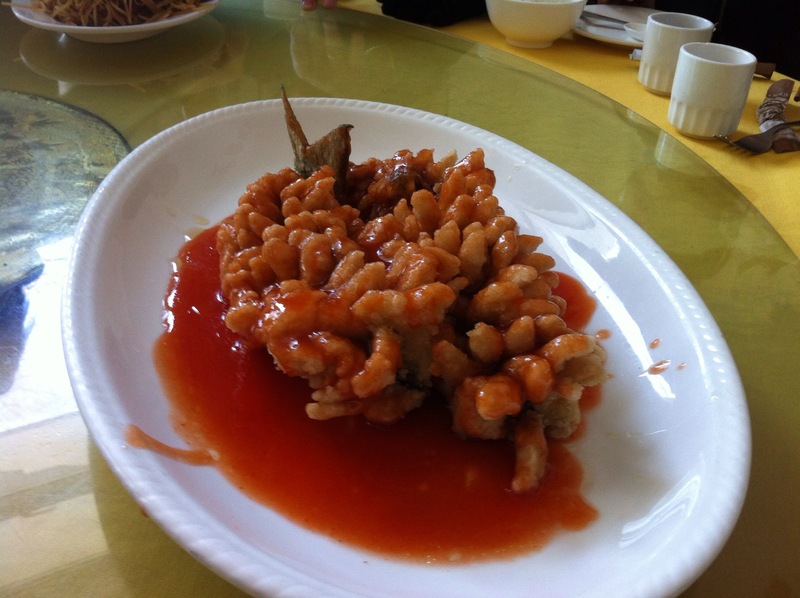 I was recommended the congee and fried Devils – which are my new favourite breakfast dish. As well as the pork buns. Hmmm, so tasty. After stocking up on food, we ventured out into the -7C morning. 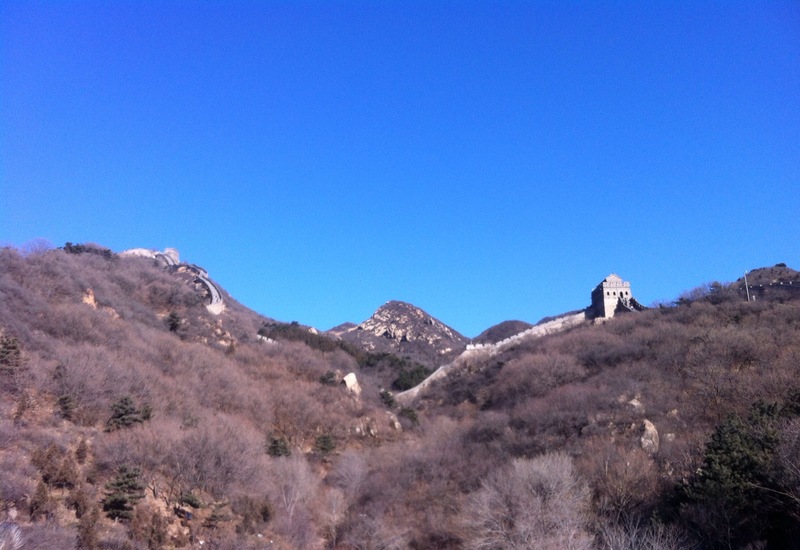 Our tour bus took us a couple of hours north of Beijing into the mountains and Great Wall country. We went to a touristy but lovely spot – Badalin – where the wind was wickedly cold in the valley where we stopped. Even with 5 layers, bobble hat and bunny fur mittens I was still really cold until we started climbing. And climb we did! Up and down insanely steep slopes and steps for about an hour. At the top, the highest point in the reachable area, the girl guide in me came out and HB and I were the envy of the group as we whipped out a flask of hot tea and snacks. The view is amazing and is an amazing feat of engineering, you can clearly see while the raiding hordes would be terrified of it. It puts my local Roman Wall to shame! We were incredible lucky with the clear blue skies all day. Tasty lunch on the way back into the city, and a fight to see whether me or RW could eat more of the Gong Bao chicken. Can’t get enough of the flower pepper and peanut combo. Afternoon naps all round on the bus back after so much fresh air, stairs, food and a warm bus. We stopped in a temple grounds near to our hotel for a quick walk to wake up. There were so many locals hanging out playing cards, games and singing – such a nice contrast to the formal coldness of Tiananmen Square the night before. After a rest dinner and a new exciting dish of inside-out fish. Another one to try at home perhaps? 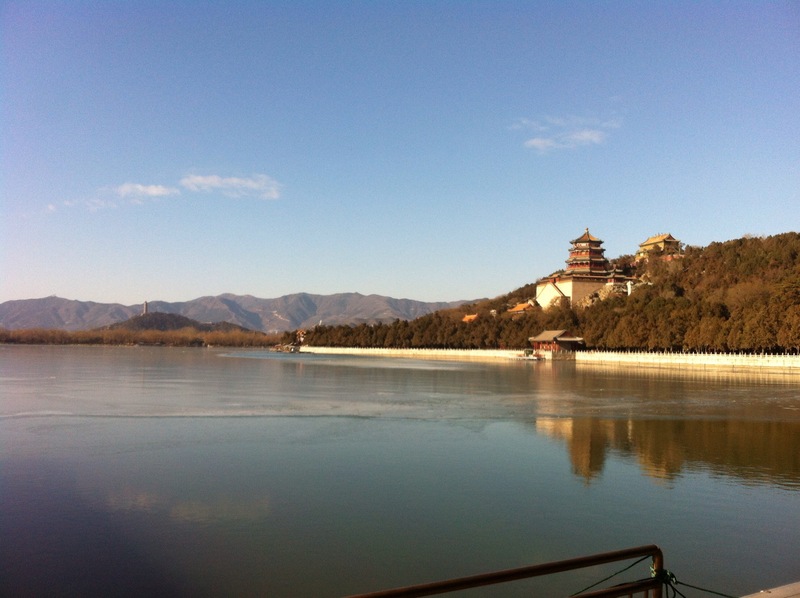 This entry was posted in Uncategorized and tagged china, great wall of china, summer palace on 21 December,2014 by antalbot. Nice day out with my fellow City and Guilds students to a couple of North London galleries. 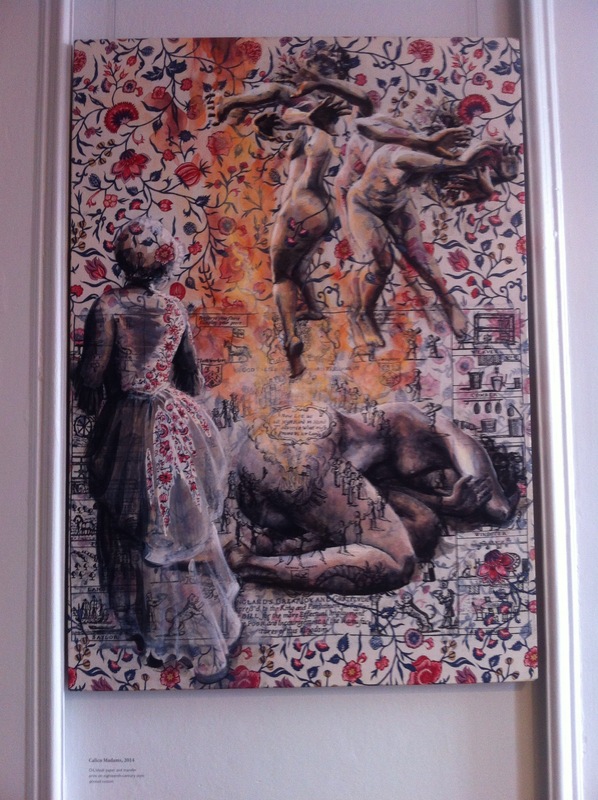 First up was the William Morris Gallery, which was showing an exhibition by Alke Schmidt: Tangled Yarns, exploring he politics and morality of the cotton trade. I rally liked the idea of using a textile backdrop as a canvas – this reminds me of the work I was doing during the spring as part of my portfolio preparation. Would be good to revisit these ideas. After a lovely cuppa and a mince pie, we wandered over to the Whitechapel Gallery to see the Richard Tuttle exhibition. Very contrasting!! From the interesting, provocative work of Schmidt with a clear narrative and strong political message we were all pretty dumbfounded by the Tuttle display. I didn’t follow it – and found myself unable to comprehend or connect with any of the work. It was very much in what I would box as fine art made only for peers – I think you really needed to be part of the art establishment to have a clue what on earth it was all for. 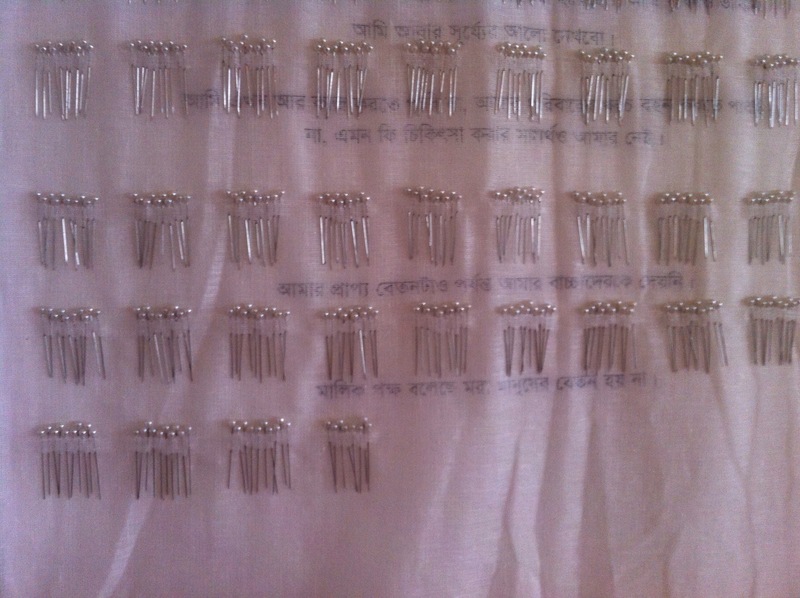 There was no craftsmanship on display, and I struggled to see the connection to textiles, language or weaving. 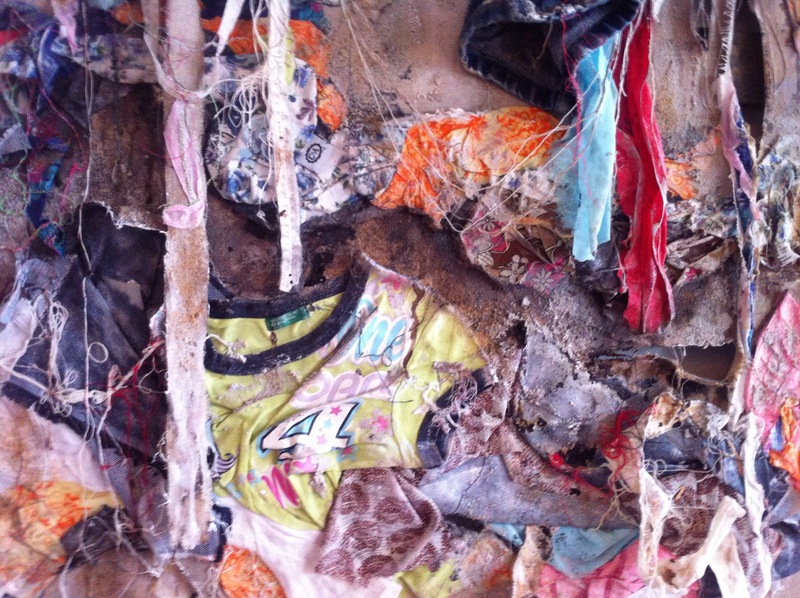 What was I supposed to interpret from a piece of dyed fabric hung on the wall? I tried very hard to engage with the pieces but sadly to no avail. What I did find interesting instead of the pieces themselves, were some of the poems and expressions around textiles which went with the exhibition. Although I found these did not relate in any way to the pieces on display, as a piece of poetry in and of themselves some were rather good. Some words below which I picked out that I particularly liked. 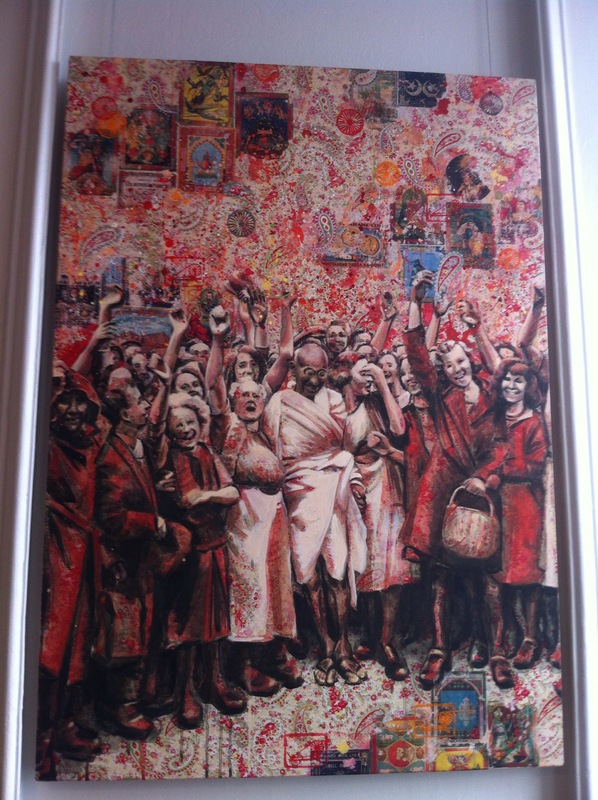 This entry was posted in 04.2 Exhibitions on 8 December,2014 by antalbot. Today we had a quiet catch up day where a few of us popped back into college for a chitchat on progress with Maiko. I talked through where I was with my City & Guilds stuff and also showed Maiko my Land art inspired leaf thing. 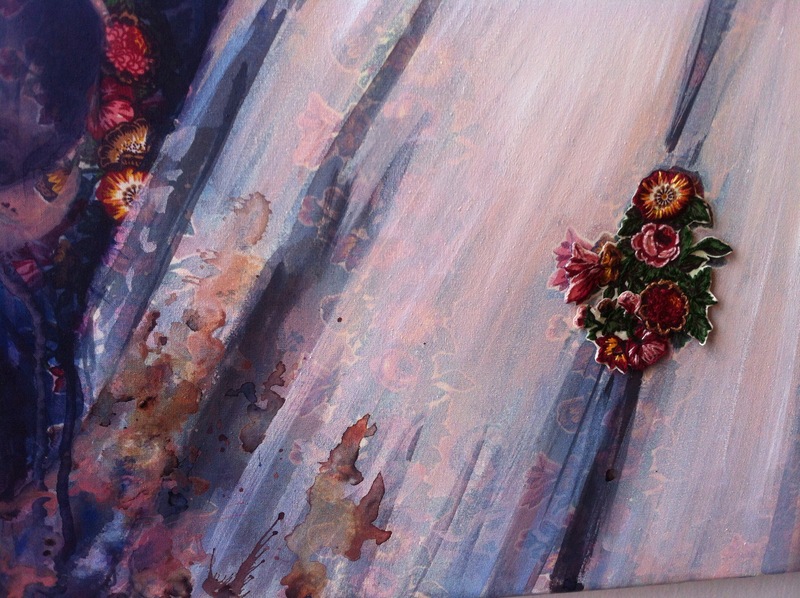 On questioning, I couldn’t really explain why I had made it and what it was signifying. I knew I wanted to make it repent the fragility and transitory nature of the falling leaf, using patchwork, but what did this really have to do with my construction? And what did my work add above a simple pile of leaves? Hmm still some work to do on understanding this “working with intent” thing. Also need to watch the trap of using natural materials and adding something to a natural beauty which humans are programmed to respond to. 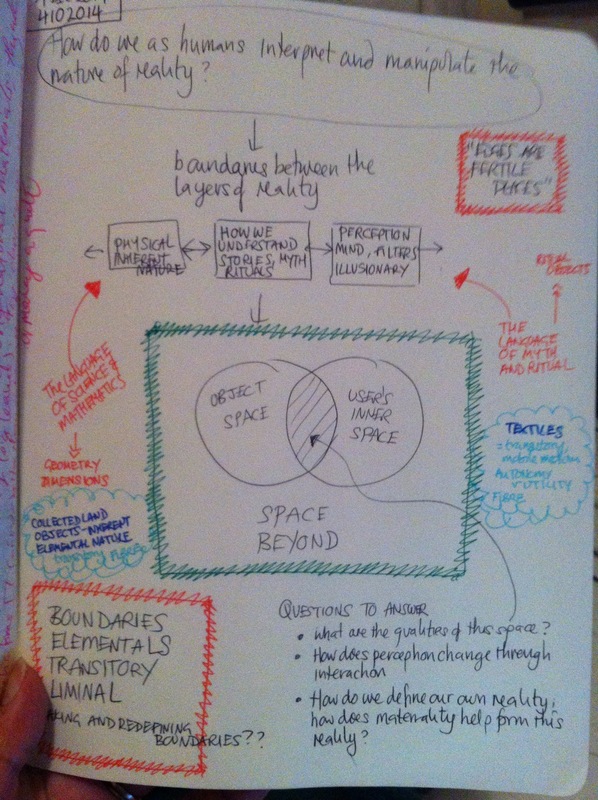 My thinking processes are good – so can I get is level of method into my making? Useful discussion though, with Maiko suggesting that I should focus on my skill areas – and see how translate / expand my quilting and sewing skills. Experimenting is fine, but I do need to progress the quality faster. Fair enough comment I thought. Some ideas on how to do this next term, which I will record here and remember to come back to! I won’t be back into Camberwell until January now, and as I am starting to feel the pains of a very, very long year I am going to declare myself officially “on holiday”. Any making, reading or gallery visits etc (like the trip planned for tomorrow!) are bonuses but it’s time for a rest and silencing the brain noise. This entry was posted in 03.3 MA Project proposal, 03.4 Tutorials and seminars on 4 December,2014 by antalbot.